Offering you a complete choice of products which include zm nut. 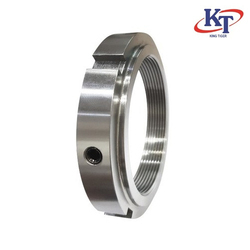 Locknuts ZM and ZMA are secured against rotation by means of two radially acting lockingpegs, ZMA is the heavy series.Thelocking pegs are manufactured together with the internal thread ofthe locknut. They mesh in the thread of the shaft without affecting therunout or damaging the thread.